Was he--as claimed by promoters--an African orphan saved by missionaries, or simply an American born-and-bred bongo player masquerading as a savage? 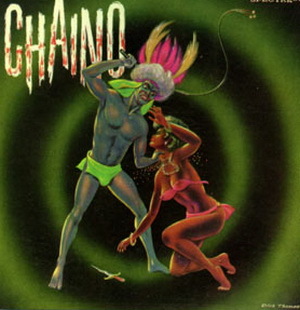 Chaino's background may be shrouded in mystery, but in the late 1950s, when this recording was originally issued, his exotic drumming and strange chants were considered so sensual the album was marketed with the alluring (though largely meaningless) subtitle "Unbridled Passions of Love's Eerie Spectre." Just over 50 years later, it's a peculiar yet still pleasing affair. About half of the tracks sport foreign-sounding names like "Woo Din Ese" and "Seis Nueve," although they're little different in tempo or timbre than numbers labeled "Don't Do It To Me" or "Mating Calypso." Each of the 12 tunes feature capable Latin or African rhythms coupled with distinctive grunts, moans and whistles. Ultimately the package is more oddity than aphrodisiac, but as a relic of a long-gone era it's weirdly appealing and, in its own way, animalistic. A long-time aficionado of retro music and movies, Jeff Berkwits has covered vintage sounds for numerous publications and websites including Bachelor Pad Magazine, Filmfax, Outré, and Amazing Stories. He can be reached at jeffberkwits@sbcglobal.net.